So, you’re a distance runner who’s been training for awhile, perhaps even run a few races. Maybe you started jogging to lose a few pounds and decided you really like running 🙂 Initially you saw steady improvement, but you’ve hit a plateau and are not getting faster. Only doing a couple of runs a week, or taking weeks off, or consistently skipping the workouts that you don’t like – will prevent you from making progress. There are no short cuts. Most runners do better with some cross training included in their program to prevent overuse injuries caused by high impact ground reaction forces and to correct common muscle imbalances. Strength training is typically the most effective for addressing strength and muscle imbalances. It can also be very effective for cardiovascular training if done as high intensity interval training or metabolic conditioning. Other good cross training activities for cardiovascular fitness include biking, swimming, or rowing. Clearly there are some issues here – usually muscle imbalances that have been ignored or undiscovered, but any training error will do. It’s time to enlist the help of professionals who can evaluate your gait, muscle imbalances, and training schedule so that you don’t keep getting sidelined. This is usually the number one reason dinged up runners come to see me – you can’t get faster if you keep getting hurt and have to start all over again. And starting all over again if you haven’t addressed the underlying cause of the problem is just going to give you the same painful result. Properly timed rest periods are part of training, whether it’s between intervals, days, or seasons in your training cycle. This can be highly individual, so listen to what your body tells you: if you’re resting heart rate is elevated, you have trouble sleeping, you are feeling run down or are getting sick easily, it’s take to back off and re-evaluate your training and nutrition. On race day, a recovered runner will be faster than an over-trained runner. This can be general nutrition, race day nutrition, water and electrolyte balance, etc. Again this is highly individual and becomes a bigger issue at longer distances or in extreme environments. Any mistake that you make with hydration or nutrition becomes magnified with longer distances. Check out the handy chart that lists symptoms of water/electrolyte imbalances by Karl King. There are several reasons why runners hit plateaus, but these are the ones that I most commonly see. 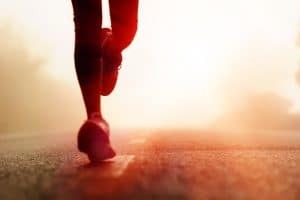 If you’d like to improve your running performance and learn the most effective and efficient way to run longer, faster, or transition to minimalist running, call me today and we’ll schedule an assessment. Once you understand your specific strengths and weaknesses, I can design a customized program to get you the results that you want.